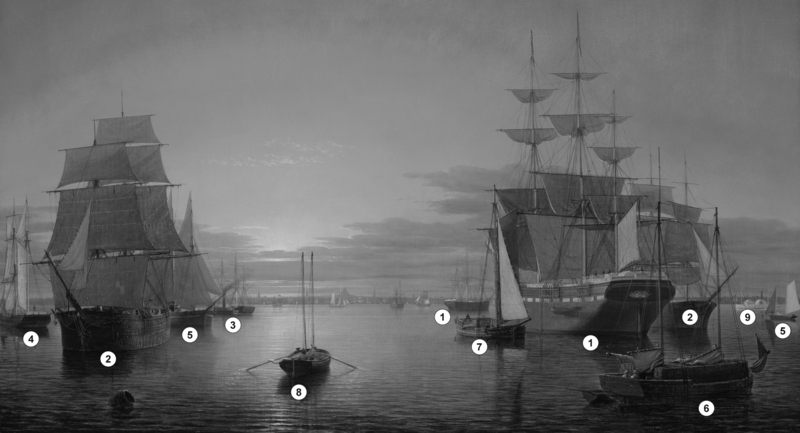 This painting, owned by the Museum of Fine Arts Boston (MFA), and its companion Boston Harbor, Sunset, 1850–55 (inv. 242) at the Los Angeles County Museum of Art (LACMA) must be treated together as they are fully developed variants on the same composition. They create a very different impression than Lane’s earlier Boston Harbor works. Here the subject is the hanging moment between day and night, between wind and calm, light and shadow, sails set and furled, boats entering and leaving, the enormity of the vessels and the smallness of man. Lane is in full mastery of his medium. In conception and execution these paintings go well beyond his previous harbor scenes. He has transformed a typical genre subject of vessels in a crowded harbor into poems of stillness, silence, and light, all hung on the geometric armature of the magnificent vessels and their alignment to the sun setting over the still harbor. Lane has taken the view as if one is low on the water in a small boat just behind the two men rowing into the path of the sunset, emphasizing the sheer mass of the great hulls and soaring height of sails and spars looming over them. The ships have seemingly transformed into enormous sentient beings of a mute order as they align themselves along a processional corridor, parting to let the rays of the setting sun reflect off the water and fill the viewer’s field of vision. Oil on canvas, 24 x 39 1/4 in. Galleria nazionale d'arte moderna, Valle Giulai, Rome, Italy, 200 anni di pittura americana (1776–1976), October 1–26, 1976., lent by Museum of Fine Arts, Boston. Museum of Fine Arts, Boston and American Federation of Arts, Des Moines Art Center, Des Moines, Iowa, The Boston Tradition, November 25–January 7, 1980., lent by Museum of Fine Arts, Boston. Traveled to: Whitney Museum of Fine Arts, New York, April 21–June 14, 1981; The Museum of Fine Arts, Houston, Houston, Tex., February 6, 1981; Pennsylvania Academy of the Fine Arts, Philadelphia, Pa., June 26–August 16, 1981. National Gallery of Art, Washington, District of Columbia, Paintings by Fitz Hugh Lane, May 15–September 5, 1988., no. 24, ill. in color, 51, as Boston Harbor. 100 Paintings from the Boston Museum. Boston: Museum of Fine Arts, 1970. Wilmerding, John. Robert Salmon: Painter of Ship & Shore. Salem, MA: Peabody Museum, 1971. Gustafson, Eleanor H. "Museum Accessions." Antiques Magazine (August 1978). Troyen, Carol. The Boston Tradition: American Paintings from the Museum of Fine Arts, Boston. Boston: Museum of Fine Arts, 1980. Wilmerding, John, ed. American Light: The Luminist Movement, 1850–1875. Washington, DC: National Gallery of Art, 1980., fig. 239, p. 42, text, pp. 111, 221. Novak, Barbara. Nature and Culture: American Landscape Painting, 1825–1875. New York: Oxford University Press, 1980. Hoffman, Katherine. "The Art of Fitz Hugh Lane." Essex Institute Historical Collections 119 (1983)., p. 32. Wilmerding, John. Paintings by Fitz Hugh Lane. Washington, DC: National Gallery of Art; in association with Harry N. Abrams, 1988., ill. in color p. 51, ill. in b/w p. 100 cat. 24, as Boston Harbor at Sunset. Training the Eye and the Hand: Fitz Hugh Lane and 19th Century Drawing Books. Gloucester, MA: Cape Ann Historical Association, 1993., p. 26-27; p. 33, fig. 26, as Boston Harbor at Sunset. Novak, Barbara. Nature and Culture: American Landscape Painting, 1825–1875. Revised edition. New York: Oxford University Press, 1995., no. 150, ill. in color as insert, as Boston Harbor at Sunset. Troyen, Carol, Charlotte Emans Moore, and Priscilla Kate Diamond. American Painting in the Museum of Fine Arts, Boston: An Illustrated Summary Catalogue. Boston: Museum of Fine Arts, 1997. Bjelajac, David. American Art: A Cultural History. New York: Harry N. Abrams, 2000. Wilmerding, John. Fitz Henry Lane. Gloucester, MA: Cape Ann Historical Association, 2005. Reprint of Fitz Hugh Lane, by John Wilmerding. New York: Praeger, 1971. 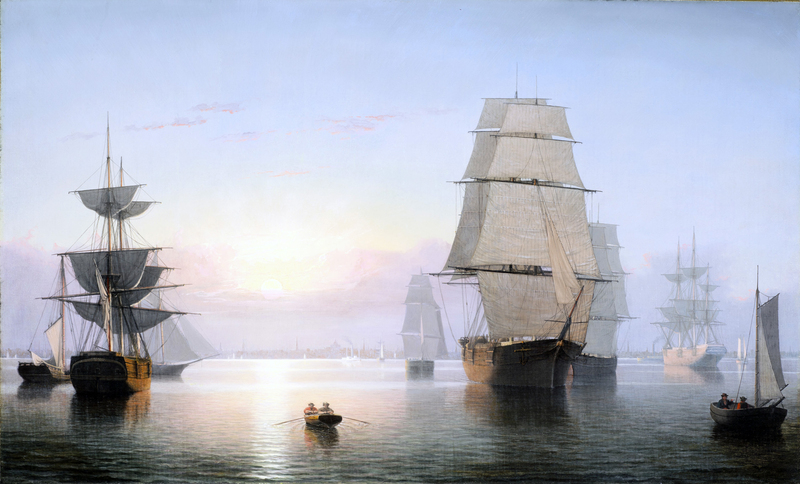 Includes new information regarding the artist's name., ill. 76, as Boston Harbor at Sunset. Craig, James. Fitz H. Lane: An Artist's Voyage through Nineteenth-Century America. Charleston, SC: The History Press, 2006., pl. 8, as Boston Harbor at Sunset. Citation: "Boston Harbor, c.1850 (inv. 48)." Fitz Henry Lane Online. Cape Ann Museum. http://fitzhenrylaneonline.org/catalog/entry.php?id=48 (accessed April 19, 2019).